Mark A Emmett, president of the NCAA, will announce sanctions against Penn State University Monday, July 23, according to sources close to the college institution that protects student athletes. The pending action by the NCAA comes a day after Penn State voluntarily removed a statue of former head coach, Joe Paterno. Coach Paterno and other university officials are accused of covering up the sexual abuse actions of assistant coach Jerry Sandusky for more than a decade. Community members have told University Park , Pennsylvania , media that “it’s hard to come to grips” with the allegations in the Freeh Commission report. Students and community still feel strong ties to the late Paterno, though his actions assisted in not stopping Sandusky from continuing the serial sexual assaults on young boys at the university. In addition to the statute, numerous plaques were removed or covered which represent decades of Nittany Lions history. Sources speaking on condition of anonymity have told major media that Penn State will not receive the ‘death penalty’ in football, but can expect a steep fine and other strong sanctions. 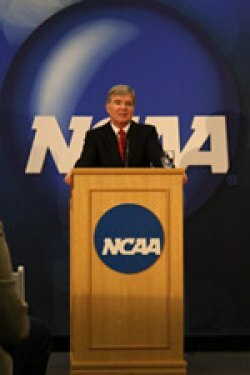 One source indicated that Emmett consulted with the NCAA’s Board of Directors on the punitive steps. There has been speculation that the college athletic rules compliance organization would not have jurisdiction over a pending criminal matter. However, the NCAA has sanctioned members for “lack of institutional controls,” which be utilized.